A plaque has been installed at the north-east hotel where Bram Stoker began writing his most famous work. The Dracula author arrived in Cruden Bay on a walking holiday in 1893 and a year later he checked into the Kilmarnock Arms Hotel. In 1896 he went back to the inn and began writing the early chapters of his novel on the mysterious Transylvanian aristocrat. Nearby Slains Castle provided the inspiration for many of the scenes that ended up in the book. Mike Shepherd from the Port Errol Heritage Group nominated the Bridge Street hotel for a plaque to help highlight the role it played in the early days of one of the greatest horror tales of all time. The commemorative plate was placed on the hotel yesterday and Mr Shepherd was there to see it. He said: “What’s great about is it is that first commemoration for Bram Stoker’s visit to Cruden Bay. Martin Taylor, owner and manager at the Kilmarnock Arms Hotel, said having the plaque on the side of the building makes their links with Mr Stoker “official”. The plaque is part of a Historic Environment Scotland scheme celebrating the lives of significant people by erecting plaques on the buildings where they lived or worked. Stoker’s plaque is the 57th announced under the initiative since it began in 2012. 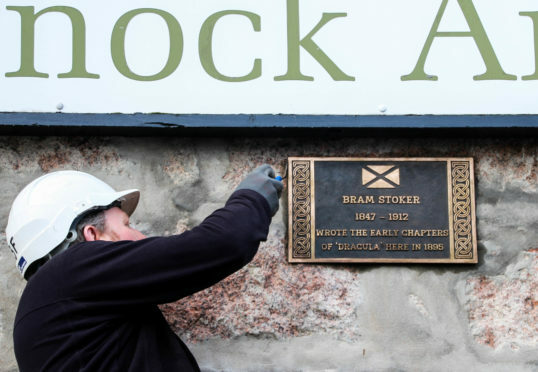 Caroline Clark, head of grants at Historic Environment Scotland, said: “This commemorative plaque highlights Bram Stocker’s connection to Scotland’s heritage.